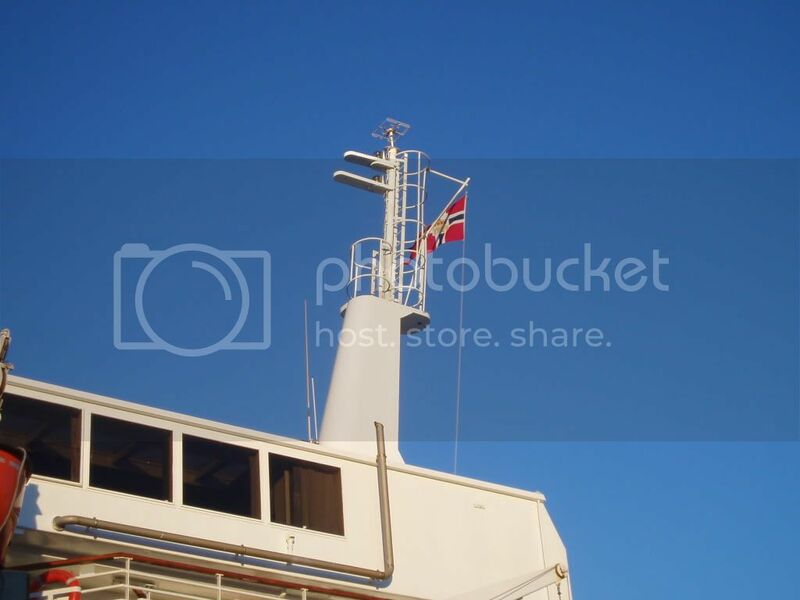 It is so interesting to see more pictures from these ships which i did not like at all after my visit on "Lyngen" in the port of Rorvik. Now, with knowledge of their history this last one in duty is an interesting time stamp and should be preserved. There are so many details to explore: similarities to the old ships like the forward lounge, improved cabin sizes and comfort like on the new ships and outstanding things like the sleeperettes (nowadays already history) and the coach alike panorama lounge at the top. 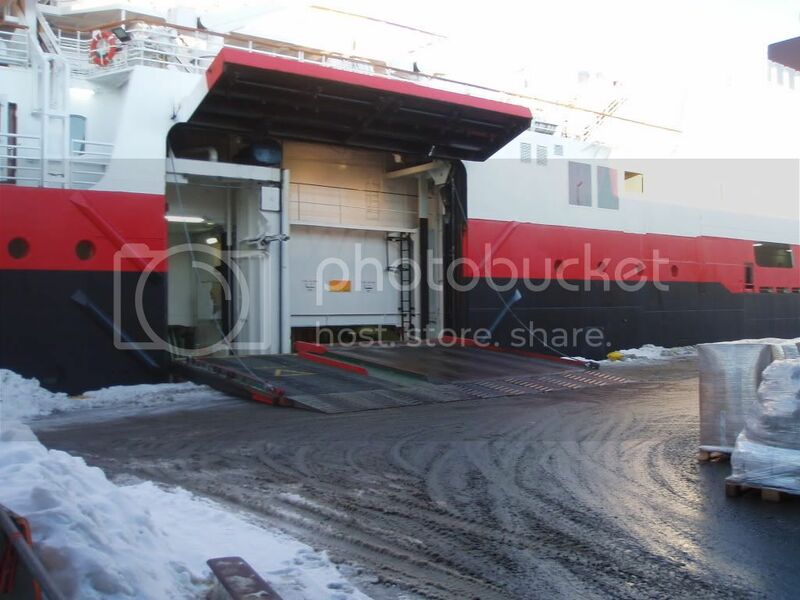 Knowing all these things, also their change of the cargo deck to additional passenger space, you will surely have an authentic Hurtigruten experience while travelling on her. But this is clear, the designers did a very bad job, because they became ugly ships after these changes. The people who worked out the change plans for National Geographic, did a much better job. Very nice image Bengt... love that it is so sharp and exactly on focus! Sharpness of an image raises the quality of an image, and might mean the difference between day and night. May I ask, did you take this image using a tripod or some steady ground? As I'm trying to learn something from other good photographers in here, I'm also interested in technical info on this picture, aperture, shutter speed, ISO and such. This should be found in the exif information of the image: but if the image has been edited by adding layers, this information will be lost. So glad and so incredibly happy to read that you are starting to appreciate more of the functions of your camera, and that you find it interesting to try out different settings. I have to also admit, that I have seen a great progression and advancement in your images: it's very evident that you are a talented person. You are catching up fast with most pro's! Thank you so much, Bengt! In addition to learn from others, I also try to learn from my own mistakes and the way I do that, is to go back to look at pictures I uploaded to different foras several years ago. Funniest pictures to look at are those uploaded right after I bought my camera. Holy Moses......, and back then I thought I was good...., hahahahaha. (Yes, I'm used to laugh at myself ). ....she is a ferry. But i like her Panorama-Lounge Fyret. Especially in winter, she should not be overcrowded and a nice place to spend the day there. 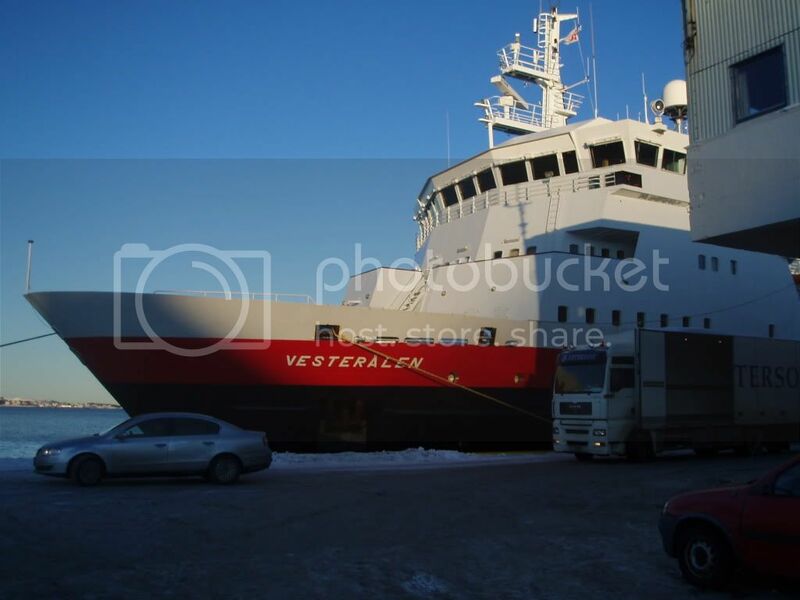 MS Vesterålen appears to be in Fredericia today. Also of interest is 'Wind Solution' but I can't quite think where/if I've seen this ship before. 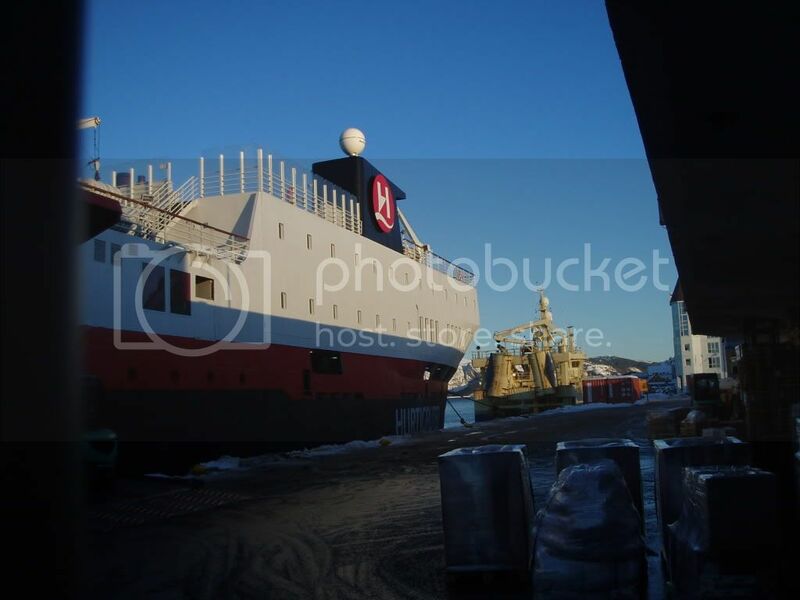 I took the opportunity to visit her in Tromsø last week! It was really nice to see her again, and yes Ralf, it seemed to be such a pleasing atmosphere on board. Many local folk in the café, and then who should I bump into but a German passenger who had been on my Greenland trip on Fram! 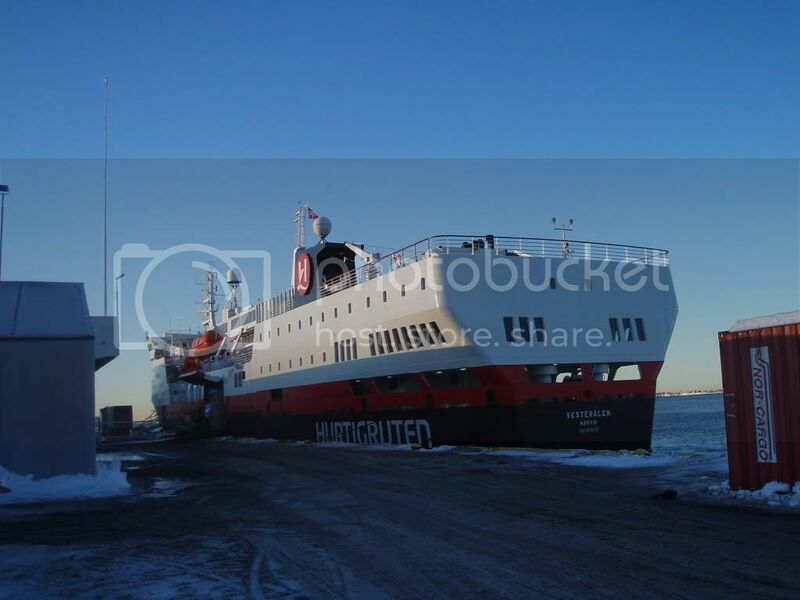 I will have extra photos to follow up my “best of Vesterålen” selection when I get round to it –especially the aft lounge which had not been in use when I was previously aboard, and, it must be said, the deck views showing the current funnel livery. 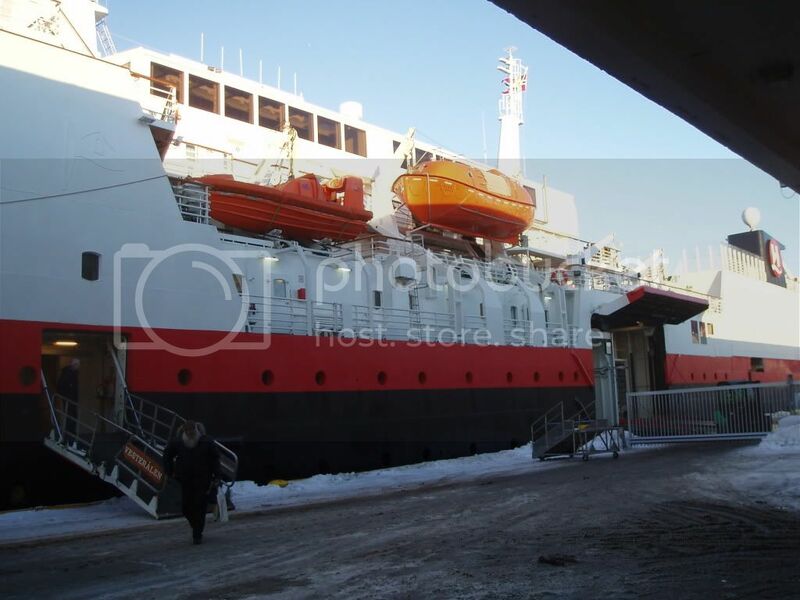 Vesterålen came to Trondheim directly from Denmark and her annual "medical" today. Arriving at the Trondheimsfjord early this morning, they spent the whole morning criss-crossing the fjord testing a new maneuvering system before docking at around 10 in the morning. Did you notice in the bow shot, that the ODS logo is still visible? This must be one of the very last old logo's still kept. Do you have any more details regarding the monuvering system?